Pirates stood for MISCHIEF, PURPOSE, and POWER. And you can too. 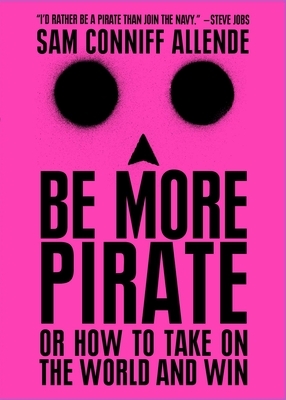 Be More Pirate unveils the innovative strategies of Golden Age pirates, drawing parallels between the tactics and teachings of legends like Henry Morgan and Blackbeard with modern rebels, like Elon Musk, Malala, and Banksy. Featuring takeaway sections and a guide to building your own pirate code 2.0, Be More Pirate will show you how to leave your mark on the 21st century. 1. Rebel — Draw strength by standing up to the status quo. 2. Rewrite — Bend, break, but most importantly, rewrite the rules. 3. Reorganize — Collaborate to achieve scale, rather than growth. 4. Redistribute — Fight for fairness, share power, and make an enemy of exploitation. 5. Retell — Weaponize your story, then tell the hell out of it. Whatever your ambitions, ideas and challenges, Be More Pirate will revolutionize the way you live, think, and work today, and tomorrow. So what are you waiting for? Join the rebellion. Sam Conniff Allende is the founder and former CEO of Livity, a multi-award-winning youth marketing agency. Sam has led the unlikeliest collaborations between brands and bright young people on the edges of society, resulting in real innovation. He has worked with Google, Unilever, PlayStation, and Dyson, and regularly speaks and runs Be More Pirate workshops at these industry-leading companies. Sam believes in the power of professional rule-breaking and is on a mission to instigate modern mutinies in organizations around the world, where the teams take over the running of the ship to ultimately become more accountable, motivated and rebellious. Be More Pirate is his first book. "This isn't a book, it's the beginning of a movement. Be More Pirate should come with a health warning." "Ask forgiveness, not permission! A unique approach...reminds me of the fun we've had with our airlines." "A model for how to break the system and create radical change." "A refreshing, entertaining and inspiring perspective on work, leadership and why we do what we do." "Be More Pirate feels so important as it looks to history to help us grip the future." "A controversial call to arms, this contrarianism is exactly what we need to course correct 'the corporation.'"